"It turns out that the caterpillar grows better with the fungus; the fungus grows better with the caterpillar," said University of Illinois entomology professor and department head May Berenbaum, who conducted the study with entomology graduate student Daniel S. Bush and U.S. Department of Agriculture research entomologist Joel P. Siegel. "The fungus is an incredibly opportunistic pathogen. It infects all kind of plants. It also infects animals on occasion, including humans," Berenbaum said. "And it's very, very good at breaking down toxins." "It's very likely that this caterpillar has managed to colonize so many new crops because its partner fungus can break down the chemical defenses of the tree crops that it encounters," Berenbaum said. 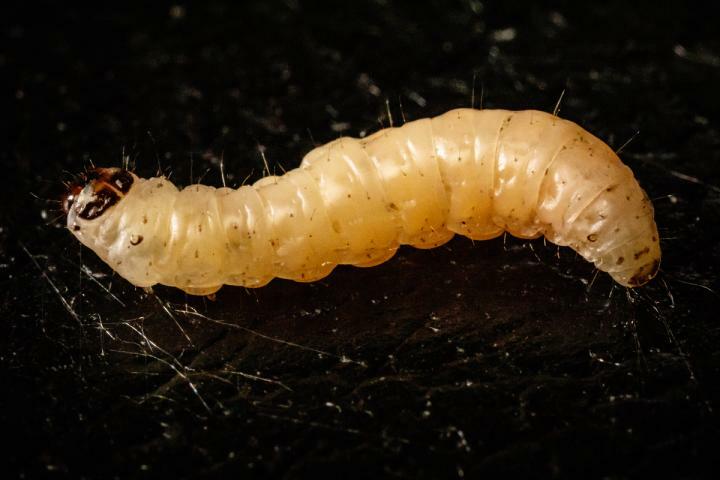 "It's also giving this caterpillar an extra edge because the fungus is breaking down some of the pesticides that growers are using to combat the caterpillar." The paper "Accelerated development and toxin tolerance of the navel orangeworm Amyelois transitella (Lepidoptera: Pyralidae) in the presence of Aspergillus flavus" is available online and from the [email protected] of I. News Bureau.